Think open offices are a thing of the past? The pendulum may have swung from rows of cubicles to an open floor plan, but we aren’t seeing signs that it’s swinging back to the traditional days. In fact, collaborative working environments are just one component of the “new” agile workplace. Companies are transforming their offices into flexible, activity based working spaces. In an effort to boost productivity and employee comfort and wellbeing, they’re designing holistic environments that speak to a multigenerational workforce and meet individual needs. They’re combining options for much needed focus (cubicles and private workstations) with spaces that encourage interaction (open work spaces and communal tables) with designs and amenities resemblant of a boutique hotel (lounge seating and gourmet offerings). Coupled with the use of digital technology (wifi and secured connections) companies are empowering employees to work where they want, how they want, and when they want. Contact us for a free consultation to learn more about the agile workplace. Over the past few years, we’ve noticed a trend in commercial workspace design in which companies are adopting a more balanced approach to the office layout. In order to meet the challenge of accommodating different employee needs and work styles, they are designing a variety of spaces. Need to crunch some numbers for the annual report? A private workstation might best suit your needs. Have an exciting RFP that needs the entire team’s attention? Team up in a huddle room and get those creative juices flowing! Innovative offices are embracing a hybrid workplace, optimizing their designs to fit the work demands of their employees and transforming their spaces to mirror today’s changing work philosophies. 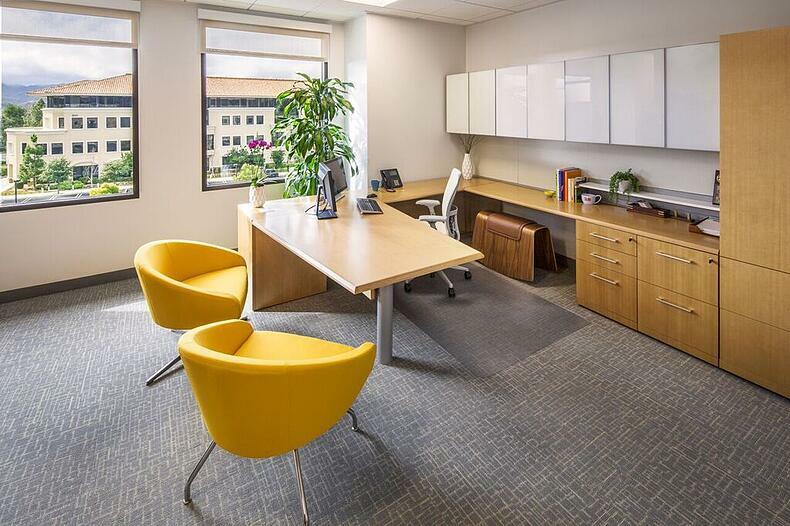 They’re merging dynamic work areas with assigned desks and blending open office space with private areas. The open office is not a thing of the past. It’s a part of the whole. Check out our case study section and see how some of the top names in their category are integrating agile workplace design. Dole Packed Goods, M Moser SF and Hudson Pacific are just a few!